The Inksupply.com WF1100 CFS offers the highest quality manufacturing because unlike other companies who are reselling flimsy import Inksupply.com has been perfecting the Continuous Flow system since 1994. This means we have taken the time to thoroughly test several Work Force 1100 printers to insure that your CFS has the highest level of quality. 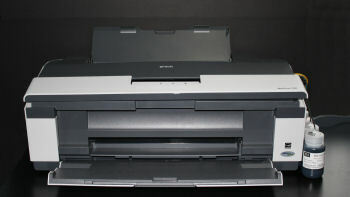 The Workforce 1100 now offers a unique double black position which makes this printer coupled with the InkSupply CFS system a great setup for any office setting. This printer is very versatile and shows the rapid evolution of inkjet technology that has taken place over the last decade. With two black positions which makes any amount of document printing when coupled with our CFS a cost effective solution that rivals any laser technology. The advancement in inkjet technology can also be seen when researching the MIS PRO archival Dura Brite equivalent inks which are recommended for our WF1100 CFS system. These inks offer improved vibrancy and dry times over previous pigmented archival inks. As always with all inks from Inksupply.com there is no profiling or special profiling necessary in order to create a spot on reproduction print. This printer also contains a very versatile print head. This has allowed us to adapt new inks that expand the use of this CFS, enclosed in the links below one can find information on our EB4 ink formulation that is made exclusively for this printer to create true black and white prints. The second link will also display further information on our Heat Transfer (HT) inks. These inks are used specifically for creating t shirt transfers. This ink is formulated to resist the intense heat transfer paper is subjected to when transferring with a clam shell heat press. This formulation also is resilient to multiple washing machine cycles.